This month isn't just about apes though. but mainly the curious ones, of course. 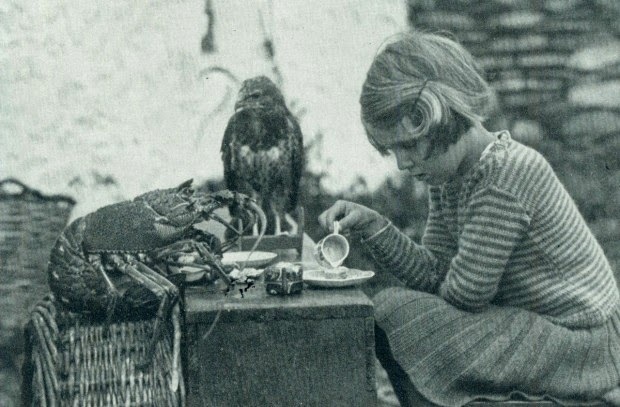 Do you have a peculiar pet? If so, I want to see! I'll post them all on my Facebook page at the end of the month. The Ape-ril Creative Challenge will also be posted at the end of the month. To give us more time to create something based on a song about an animal. A Kong documentary is in the works actually. You can donate to help make it happen here. I have some musical items to review too. So stay tuned for those and a giveaway soon! Ok, the Lobster taking Tea gave me a guffaw! I have no pets other than a fish and I don't think OCD circles around the bowl count as interesting. A fish with OCD sounds pretty interesting to me! Oh I'd LIKE a gorilla, but at the moment just a gorgeous Spoodle who begs for cheese and 'Rocky' the Siamese fighting fish, named after Frankenfurter's creation not the boxer LOL cute clip! I love that you named your fish after Frankenfurter's creation!